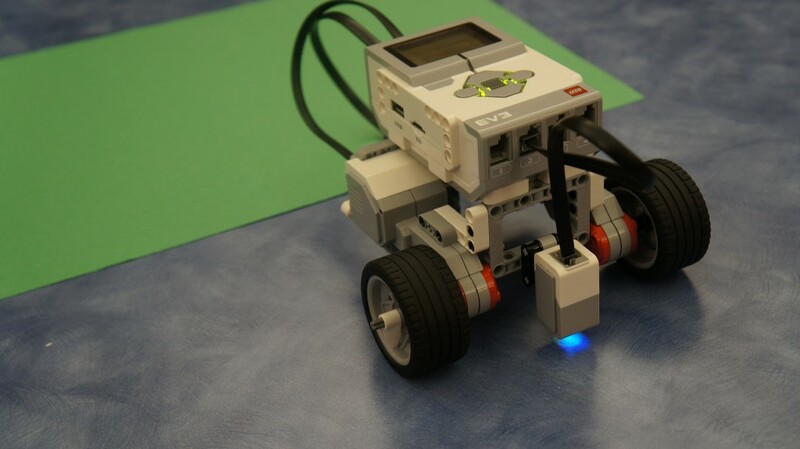 Robotics: the science or technology of designing, building, and using robots. Whether it’s a large machine from a favorite science fiction novel or a transforming super hero, we all have an idea of what a robot is. However, these fantasies are not (or not yet, at least) the case. But robots do play an increasingly integral role in our current society as high-tech tools. They provide the necessary efficiency, safety, and capability to generate cutting-edge products. Knowledge in the area of robotics is a fast-growing and highly specialized skillset. 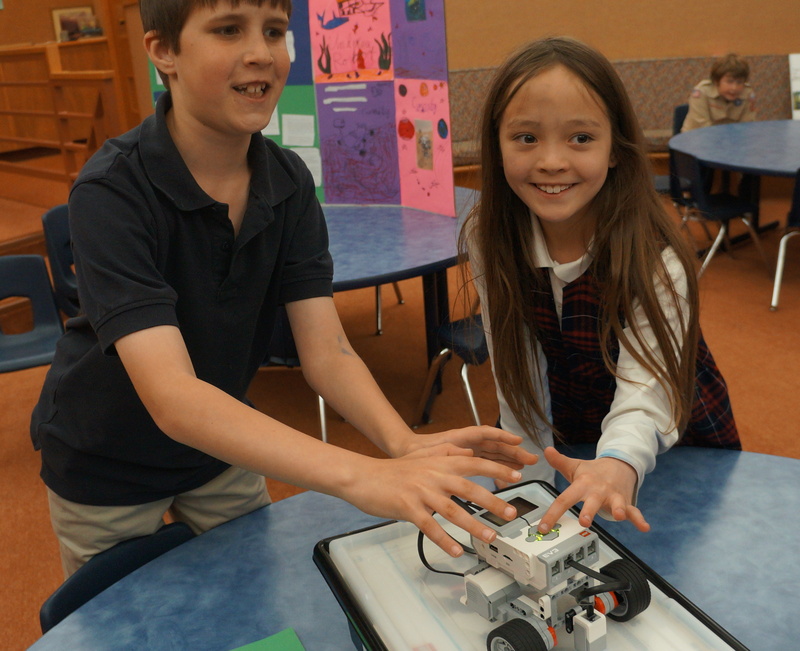 The Prairie School has embraced robotics and understands its importance in the 21st century classroom. On approximately 10 consecutive Mondays from January 6th through April 21st, a hard working pilot group of parents, teachers, and students came together after school hours for the purpose of exploration and creating beginning experiences in robotics/computer programming. 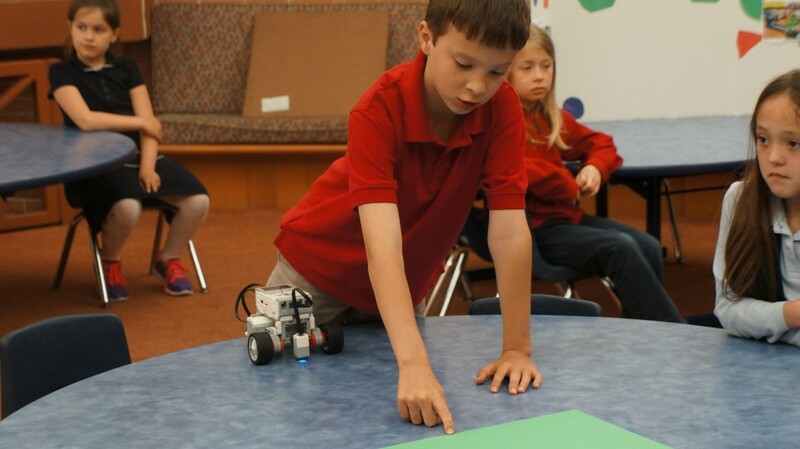 Eight students in teams of two, researched different types of robots, and through the use of LEGO Mindstorms EV3 materials, created flowcharts, programmed their individually-built robots to perform basic tasks as well as collaborated on task challenges like programming a robot using sensors to move in an 8-shape or stay on a table top. Prairie parents, Mrs. Anna Matson, Mrs. Myra Takerian, and Mr. & Mrs. Jorgenson shared their time, experience, and talent with engineering, computer programming, and LEGO problem solving, taking the lead with these exciting sessions! Prairie’s own technology specialist, William Ogden, and Middle School/Upper School math and science teacher, Rick Craig, also attended and lent support during these sessions. 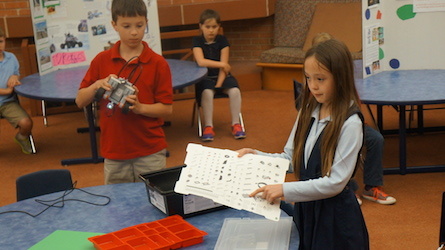 Beginning next school year, the students in Kindergarten through Grade 4 and beyond will be learning computer programming and robotics as part of the science curriculum, which will include an open-ended series of elementary Science, Technology, Engineering and Math (STEM) activities. We look forward to this additional programming to enhance and challenge the way students are thinking critically! The robotics/computer programming activities will increase hands-on collaboration, and provide thought-provoking opportunities that may encourage students to think differently about their futures and professional careers. This entry was posted in All News, All School, Featured, Primary School, Technology by Communications Department. Bookmark the permalink.